SBI PO exam 2018 is expected to be held in the month of July. Here is Data Interpretation quiz for SBI PO exam 2018. Data Interpretation is one of the most important topics of Quantitative Aptitude section of SBI PO Exam. Aspirants must have clear understanding of the basic concepts of Average, Percentage, Profit and Loss, Ratio and Proportion etc. Solve the below DI quiz and strengthen your preparation for SBI PO exam 2018. The number of students in each of the colleges A, B, C and D is given in the brackets (). The vertical axis shows the percentage of students who have opted for Humanities, Commerce and Science respectively. 1. What is the average number of students who have opted for Science from all the schools taken together? 2. What is the ratio of the total number of students who have opted for both Science and humanities together from School B to that from School C? 3. Which of the following combinations represent the schools with the minimum number of students who have opted for Science and the minimum number of students who have opted for humanities respectively? Hence minimum number of students opting Science is in School D.
4. 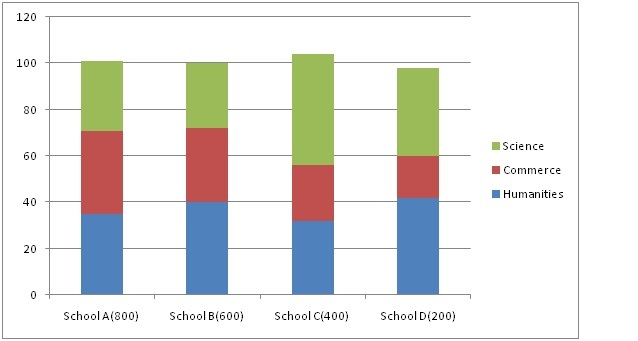 What is the ratio of the number of students who have opted for Humanities from School C to those who have opted for the same subject from School A? 5. The number of students who have opted for Science form School A is what per cent of the number of students who have opted for the same subject from School B?